My cousin Tommy used to make amazing fish chowder. Back in those days, it was usually made with the fish that he actually caught (often Walleye). I haven’t been fishing since I was a teen so I won’t be making it with fresh fish anytime soon. Today I used frozen fish (Haddock works well, Alaskan Pollock, and I tried it today with Tilapia). Tommy died a few years ago, so I got the recipe from my cousin Tim since he also has made it in the same manner as Tommy. So here it is (roughly). It makes a big pot so judge accordingly if you want to make a half batch etc. The trick to getting the creaminess is soaking a couple of tubes of soda biscuits in condensed milk. Don’t try to cut corners and use regular milk – it will not produce the same texture, it’ll be watery and nowhere near as good. In a large bowl, dump the contents of soda biscuit tubes and cover with the condensed milk. Set aside. In a large stock pot, sautée the onions in the oil. When they’re translucent, add potatoes and enough water to cover them by about an inch. Boil potatoes until they’re almost cooked (about 20 min.). Add fish and salt and boil until cooked (about 5 min.). Carefully add condensed milk and soda biscuits to the stock pot and heat for 5 min. on low heat (you don’t want to scorch it!). Serve hot. I like to garnish with bacon bits but it’s not necessary. 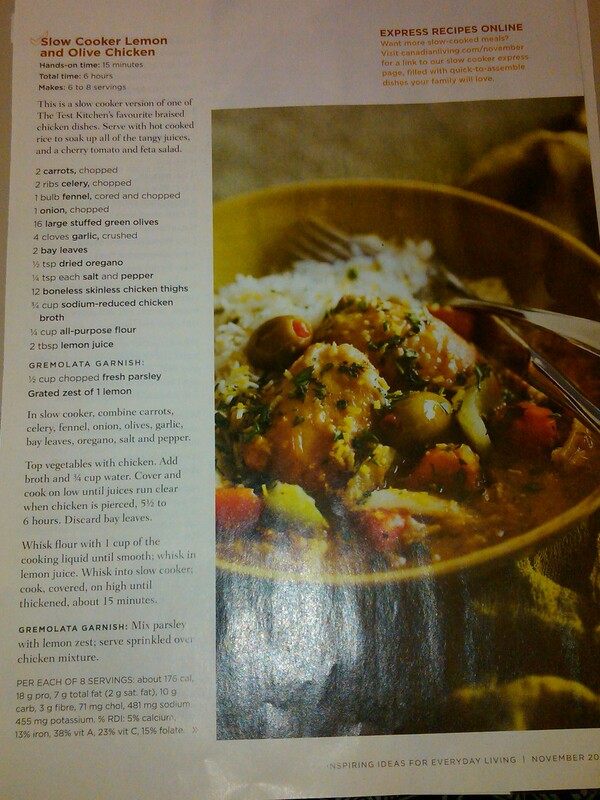 I’ve decided just to take pictures of magazine recipes I like and post them here. It will save me from having to type everything out. It might not be the best quality but at least it’s readable. I got this recipe from a YouTube video Allison Pacino made. I never thought to use spaghetti sauce as a base for tomato soup and thanks to her, it’s now a favourite of mine. I modified hers a bit. Feel free to add whatever veggies you like to it, I think almost anything would work. Rinse quinoa in a sieve until the water runs clear. Mix all ingredients in a microwave-safe dish and microwave for 5 minutes. Stir. Microwave for an additional 5 minutes or until quinoa is cooked (times depend per microwave). You can cook all ingredients in a medium pot on the stove for about the same amount of time. If you want a thinner soup, add more water until the desired consistency is reached (about 1/2 c. at a time). I made this stew and it smelled heavenly. It tasted divine I also made dumplings which go very well with it. In a large pot, add olive oil and beef. Brown the beef over medium-high heat then add wine. Bring to a boil and add remainder of ingredients starting with the broth. Boil for 1 hour or until all vegetables are fully cooked. Remove bay leaves and serve hot. One of the things I love making is soup. I can control the sodium levels (to a certain degree), what exactly is going into it (no preservatives or strange ingredients) and it’s generally more healthy than store-bought soups since you can also control the fat content, etc. This soup is also packed with vitamins. 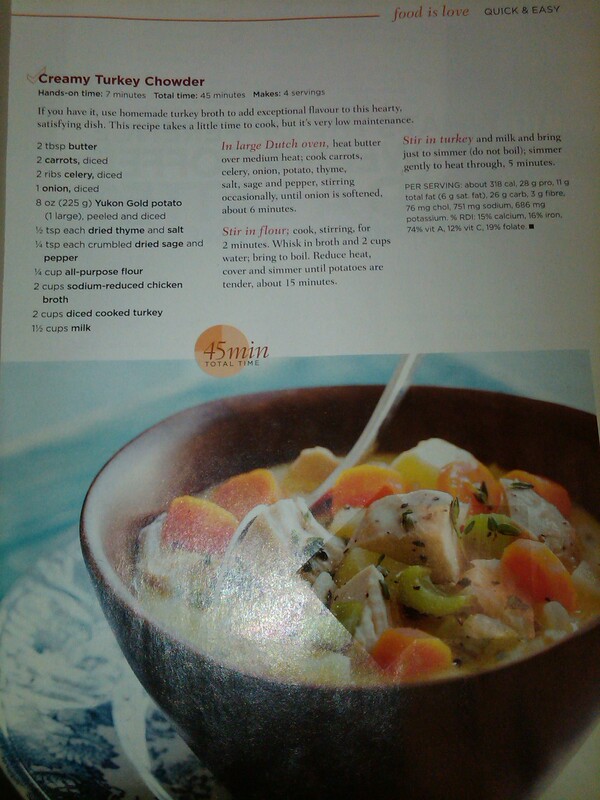 You can try variations of this soup (adding or subtracting ingredients) and I’m sure it will turn out great. In a large pot, add all ingredients. Bring to a mild boil for 1 hour or until all vegetables are fully cooked. The whole pot of soup is about 1400 calories. Since I’m a garlic lover, I add 3 tsp. garlic powder. This is especially good if you have a cold. If you find it’s too thick, add 1 c. broth and 3 more c. water to thin it out. Don’t forget to season to taste.